1.) 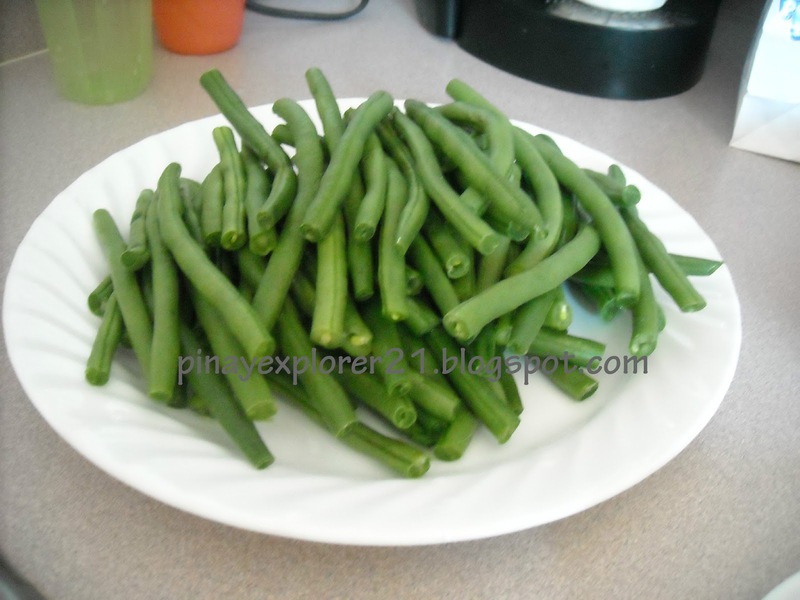 In large pan, bring water to boil, add the green beans. Let it boil for 5 minutes or until half way cooked and crisp in texture. 2.) Placed the green beans into ice water to stop the cooking process and to retain the color and texture. 3.) Meanwhile, In large pan, cooked the bacon until golden brown and crisp, add the onion and sauteed for couple minutes. 4.) Drain the water from the green beans. Then, add the green beans into the pan and sauteed for 4-5 minutes until everything cooked but still have that texture from the beans. 5.) Salt and Pepper if needed. Share and Enjoy! 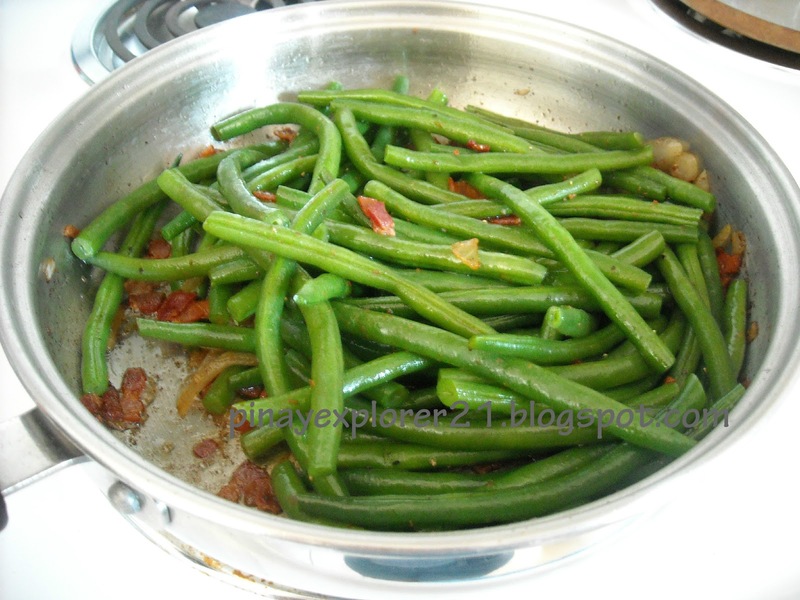 - blanching method is important to obtained great texture of the green beans. Never tried it with Bacon! :D My mom loves green/string beans a LOT! LoL! I bet she'll love this recipe! I didn't knew about the ice thing. Hmmm... that's why some steamed vegetables served in the restaurants are still green and looking fresh. I haven't really cooked green beans for the kids.. normally if I will be cooking it with mince pork. Blanching is a process making the vegetable crispy and not overcooked..hehehe may alam din pala ako kahit papaano.. I love green beans too! I have never done blanching before. Thanks for sharing a very useful tip. I want some veggies tuloy this midnight. I had chicken kasi earlier. giniling sound so perfect for beans as well,, SARAP! I love green beans but as a carnivore, I'm drooling at the caldereta! MMmmmm, I love green beans! I always have ever since I was a child too. Beans loved it! But of course for the older ones with high uric acid should lessen their consumption. another way to cook sitaw...will try this one too. now, I know what to do with my green beans here!